'Sura', was a 'Royal Siamese' male , (a seal-point), that lived during the golden age of the emergence of Siamese as a new tour-de-force in the world of cats. Anyone who was anyone in the cat world, owned a Siamese, often imported, or bred from imported stock. Many well-known ladies were taking up the cause of the Siamese cat, among them being the titular President of The National Cat Club, the Duchess of Bedford, and very notably, The Hon. Mrs. McLaren Morrison, who could easily claim to have one of the largest catteries in England at the time. As a committee member, breeder and importer of cats, she was in fact, one of the most significant supporters of The National Cat Club, as a study of the first five volumes of The National Cat Club Stud-Book and Register confirms. Of the over 1800 cats recorded there-in, 175 were either owned or bred by Mrs. McLaren Morrison, which represents a whopping 9.72% of the entire register! Of the 93 imported cats, some 29 belonged to Mrs. McLaren Morrison, representing 31.18% of imported cats that had been registered. But her interests were not exclusively confined to cats, as she was also one of Britain's most avid importers of dogs, and a well-known fancier in both domains. While a strong supporter and Committee member of the National Cat Club, she was equally a keen member and exhibitor with the Ladies Kennel Association. "Mrs. Morrison has not confined her attention to dogs alone, but has for many years kept a considerable number of both long-haired and short-haired cats, with which she has won numerous prizes at the best at the Crystal Palace and other places. I think she has chiefly kept Blues and Whites in the former, and Tortoiseshells, Tortoiseshell and Whites, Blacks and Pure Whites in the latter, and she has been one of the most spirited buyers at the shows, frequently claiming some of the high-class specimens which took her fancy." "If anyone had any doubts about this lady being a keen and enthusiastic fancier and lover of animals, they would be dispelled by the fact that, although her kennels are situated at Kepwick Park, far away from a railway station, in the neighbourhood of the Yorkshire Moors, near Thirsk, she has been represented, even during her visits to India with her husband, who has held an appointment there, at many of the shows in other parts of England." Although Mrs. McLaren Morrison's interest in cats dates from the mid 1880's, it was not until 1895 that we find evidence of her interest in Siamese. Her first purchases appear to have been from a litter bred by Mrs. Chapman in May of 1895, sired by 'Puppy' and out of 'Susa'. which included two males and a female, respectively named 'Siam of Kepwick', 'Bangkok of Kepwick' and 'Princess of Siam'. Initially, one is left wondering why anyone would buy three kittens of the same breeding, but not when you realise that the sire 'Puppy', who was owned by Mrs. Chapman, was a son of the original 'Tiam O'Shian I' imported out of Bangkok. This made 'Puppy' a half-brother to 'Tiam O'Shian II'. 'Susa' it would appear had changed hands, as originally, in an earlier breeding between her and 'Puppy', she had produced the male 'Tiam O'Shian III' for her owner Mrs. Forestier Walker, and this male had been taken by Mrs. Walker's sister, Mrs. Vyvyan. 'Tiam O'Shian III' had been born in September 1894. But by May 1895, when her next litter to 'Puppy' was produced, she was in the ownership of Miss Robbins. 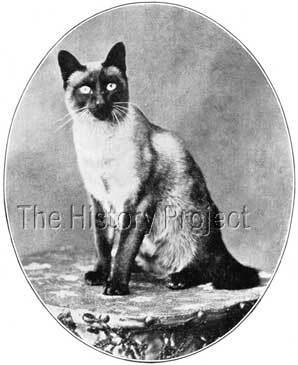 Given that Mrs. Forestier Walker and Mrs. Vyvyan were the most consistent producers of winning Siamese, it follows that others who wanted to breed quality Siamese would follow their example, and hence The Hon. Mrs. McLaren Morrison wasted no time in securing kittens from 'Susa's' next litter to 'Puppy', directly from Miss Robbins. Mrs. Morrison was also the owner by this time, of an imported Siamese male, named 'Juggler'(NCC: 2178), for which no information exists other than that he was imported. 'Princess of Siam' would however, later gain her Championship. Other full siblings to come from this same breeding also included Miss Chapman's own 'King Wallypug' and his litter brother Miss G Willoughby's 'Fulmer Banjo'. "'King Kesho' the well-known male, (sire of many beautiful kittens) I bought from Mr. Forsgate in 1894; he claimed descent from the Duchess of Bedford's, Mrs. Seton Kerr's, and Miss Forestier Walker's cats; he had large bold eyes of a glorious shade of blue, and very dark points; he won many prizes and specials, but died in 1897." 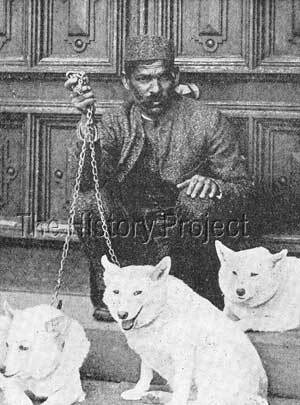 It should also be noted that 'King Kesho' was also a full litter sibling, to the first and original 'King of Siam', bred and originally retained by Mr. Forsgate, then later sold to Mr. Temple, and eventually becoming the property of Lady Marcus Beresford. 'Prince Damrong' was purchased by The Hon. 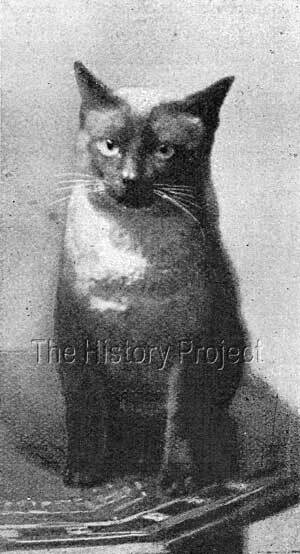 Mrs. McLaren Morrison as a kitten, from Mrs. Robbins, in 1896, and his name was immediately amended to 'Sura'. Mrs. McLaren Morrison had purchased kittens from this exact same breeding before, beginning with a Royal Siamese female named 'Penang', born in July, 1895. She then returned to Mrs. Robbins six months later, to buy both a male and female kitten from a repeat breeding, namely 'Kepwick Royal' and 'Kambodia', born in January 1896. The Siamese Register shows that 'Kepwick Royal' gained a first at an NCC Show that year, but as no progeny are listed from him, we may assume that he may have died of the dreaded 'show fever'. This possibility would appear to be backed by the fact that from yet another repeat breeding between 'King Kesho' and 'Lady Betty', born 13th July,1896. The Hon. Mrs. McLaren Morrison then purchased 'Prince Damrong'.This would tend to support the view that she was an admirer of both the dam, 'Lady Betty' owed by Mrs. Robbins, and of 'King Kesho', owned by Mrs. Carew Cox. As an example of the great care taken with her precious Siamese acquisition, the following is an extract from an article about 'Sura' published in The Sketch in October of 1897. "Among the famous breed of royal cats from Siam, 'Sura' (late Prince Damrong), is among the most important. * He was bought by The Hon. Mrs. McLaren Morrison last year, but, as his mistress was leaving England for India, he was placed in the care of Miss Manley, who is well known as one of the most popular and capable lady judges at both dog and cat shows. 'Sura' was taken to Kensington, and soon became devoted to Miss Manley's lovely little King Charles, 'Boscobel'. "The beautiful pair are never apart. They eat out of the same dish, sleep together on the fur hearthrug, 'Sura' making 'Bossie's' body his pillow, and they often go out for a walk together on the same lead. "When photographed recently at the bas-relief studio in Dover Street, 'Sura' proved utterly unmanageable until his friend was placed on the table beside him, when he sat quietly and condescended to have his portrait taken. At home, 'Sura' is a charming cat, showing a pleasing curiosity in the doings of all Miss Manley's friends. He has every desired point in full perfection - the close, fine fur, cream colour with chocolate markings, the most brilliant china-blue eyes, and the requisite 'kink' at the end of his tail, which distinguishes him as one of the royal cats of Siam." *Given that the death of 'King Kesho' also occurred in 1897, this remark would have had significant meaning for Siamese breeders. By 'King Kesho' ex 'Lady Betty'. An older full sibling to 'Prince Damrong', bred by Miss Robbins and owned by Miss Cockburn Dickinson. Shown as a kitten at Brighton and the Crystal Palace for seconds, in 1894. An older full sibling to 'Prince Damrong', bred by Miss Robbins and owned by The Hon. Mrs. McLaren Morrison. An older full sibling to 'Prince Damrong', and a litter sibling to 'Penang'. Bred by Miss Robbins and owned by Miss Cockburn Dickinson. An older full sibling to 'Prince Damrong', and a litter sibling to both 'Penang' and 'Yakkae of Londesborough'. Bred by Mrs. Robbins and owned by Mrs. Carew Cox. By 'King Kesho' ex 'LadyBetty'. An older full sibling to 'Prince Damrong', bred by Miss Robbins and owned by The Hon. Mrs. McLaren Morrison. Shown for a 1st at NCC 1896. An older full sibling to 'Prince Damrong' and a litter sibling to 'Kepwick Royal', bred by Mrs. Robbins and owned by The Hon. Mrs. McLaren Morrison. A full litter brother to 'Prince Damrong', bred by Miss Robbins and owned originally by Mr. George Dimond, then latterly by Mr. Conrad Cooke. Shown successfully as a mature adult,gaining 1st, Botanic, and 3rd Crystal Palace , 1901; 2nd Botanic and 1st Crystal Palace, 1902; and 3rd Crystal Palace, 1903. Another full litter brother to 'Prince Damrong'. Bred by Miss Robbins, this male was retained by her for breeding. A portion of The Hon. 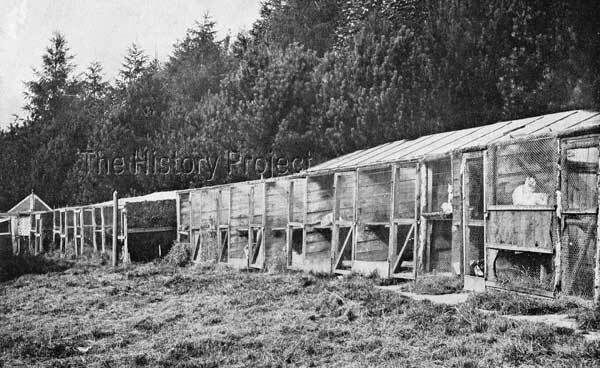 Mrs. McLaren Morrison's cattery at Kepwick Park, near Thirsk. 'QUITZ', 'KLINKIE' and 'RYNDA', were all born in a litter produced in February 1896, by 'King Kesho' and out of Mrs. Brodie's 'Minita' (aka Minnie). The male, 'Quitz' was sold to Mrs. Levenson, the female 'Klinkie',was originally sold to Mrs. K.O. Chapman, but was later moved to Lady Marcus Beresford, and renamed as 'Windsor Klinkie'. The second female, 'Rynda' was first owned by Mrs. Levenson, but later went as a breeding female to Mrs. Mary Robinson. 'Princess Chepa of Wyresdale' (a female born June, 1904), owned Mrs. Matthews and Miss Hilliard. 'Klouma' (a female born 1905), owned by Mrs. Mary Robinson. 'Blue Bell of Drayton' (a female, born 1907), retained by Mrs. Spencer. "....I tried to put aside all thoughts of securing another, and not until September, 1893, did I again fall a victim to the attractions of this breed, purchasing a female of about one year old, from Zache, of Great Portland Street. I named her 'Yuthia'; she was supposed to have been imported, had very expressive blue eyes, and she lived until February 1899." 'YALU' and her litter sister 'HAIDEE II', females born 24th August, 1895. By 'King Kesho' ex 'Haidee'. Bred by Mrs. Derby. 'Yalu' (NCC:3212) was sold to Mr. J.M. Gordon Dill, while 'Haidee II' was retained by Mrs. Derby for breeding. By 'King Kesho' ex Mrs. Brodie's 'Minita'. 'Bennie' was a full younger sibling to 'Quitz', 'Klinkie' and 'Rynda'. He was originally retained by Mrs. Brodie, but later sold to The Hon. Mrs. Green Wilkinson. 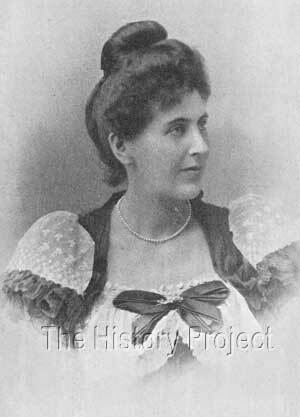 Interestingly, Mrs. Wilkinson was also the owner of a female named 'Minnie', sired by Lady Marcus Beresford's 'Tachin' and out of another daughter of 'King Kesho' named 'Kora', owned by Mrs. Hankey. The only show result for 'Sura' is that recorded in both the National Cat Club Register (NCC) and The Siamese Cat Register (SCR), and that was a 2nd, at the NCC Show of 1897. However, many breeders of Siamese in particular, were quite loathe to risk showing their precious cats, which were not so easily raised or acquired, but very easily lost to the stresses and risks of shows and 'show fever'. "My 'Royal Siam' came from the royal palace, and I consider him a splendid specimen. I did not breed from him until he was between three and four years old, which may be one of the reasons why all the kittens by him are so wonderfully strong and healthy. He has never ailed anything since I have had him. I have never placed him at stud, but have allowed a few friends to send their queens to visit him. Neither have I ever exhibited him, for he is far too precious a pet to be allowed to run any risks. My queen 'Princess Maimoune', is also a fine strong cat, a daughter of Mrs. Carew Cox's 'King Kesho'; and many are the prize-winners bred from these two." The Hon. 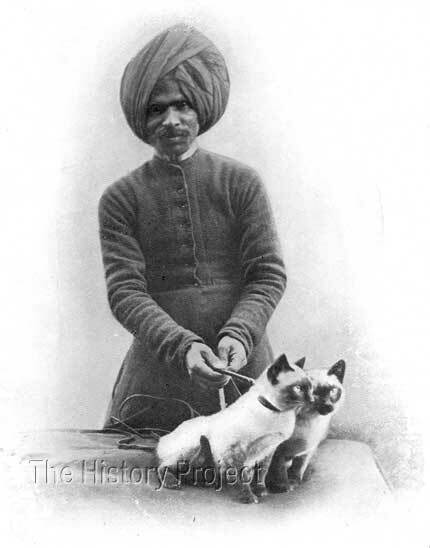 Mrs. McLaren Morrison's trusted native Indian kennel-man, 'Succo', with two of her Siamese cats. He was often seen at both dog and cat shows with her exhibits on a leash. There are no progeny of record for 'Sura'. There are entries for 'Prince Damrong', but although most of these are for Siamese bred by Mrs. Robbins, they more likely to be for those sired by her later male, who was similarly named 'Prince Damrong Royal', and who was born in January 1906. All of the progeny thus listed, were born from 1907 onwards. Although published in 1903, this photo could easily date from well before 1900. 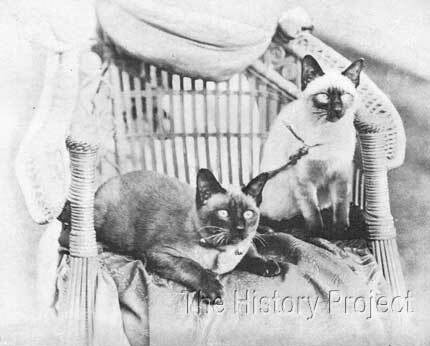 Given that these cats were known to be favourites of their mistress, the image could well be of 'Sura' and 'Princess of Siam' or alternatively, 'Siam of Kepwick' and 'Princess of Siam'. The above image of 'Sura' gives us more clarity and an insight into the possible phenotype, of all of the listed progeny of 'King Kesho' and 'Lady Betty'. The story of his great care, while under the stewardship of Miss Manley, is a timely reminder, that breeding cats are also pet cats, and should be treated as such. "Only those who possess Siamese can understand how reluctantly a lover of this breed takes up a pen to endeavour to do justice to its characteristics - it is like attempting the impossible. One feels one must step softly - so to speak - in the presence of these wonderfully fascinating creatures, whose thoughtful yet penetrating eyes appear to see far and so much, whose intelligence seems almost human, and who seldom stay with us for long." Her words do appear to tread softly and with a respect and reverence for the breed, that humankind should, and must, emulate for all cats, and indeed, all life.